Firstly, the Vaporesso Orca Solo AIO Kit (All-In-One) is the ideal way to start vaping and stop smoking. Above all, quick to set up and always ready for use. Within the kit you will receive a stylish, easy to use vape pen. The perfect kit for starters and mouth-to-lung enthusiasts alike. Steady vaping because it comes with an in built 800 mAh rechargeable battery. The unit’s battery is charged via USB and furthermore reaches a full charge in 45 minutes. The CCELL coil supplied is optimised for high nicotine satisfaction. Furthermore, you will receive two replacement coils within the kit. Easy use is guaranteed by the stylish, compact, one-button operation design. This probably due to fixed wattage output ensuring no messing. A mini version of the Omni Board Chipset installed in the device provides it with safety features to protect the user and the device. Consequently, all you need do is fill with liquid and vape. 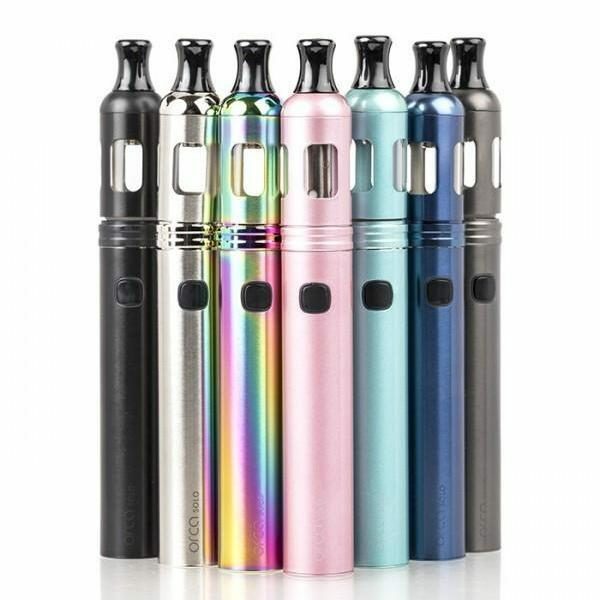 The device features a 1,5ml e-liquid capacity with top-fill mechanism. As a result the unit can be used with either salt nicotine or standard e-liquids. The Orca is also a TPD compatible vape device. Customers have a choice of two Vaporesso Orca replacement coils. Consequently providing a longer lasting experience. One coil using standard cotton wicks while the other uses ceramics because of improved heating capabilities. The buyer can choose from a wide range of colours including Black, Blue, Metallic Grey, Mint Green, Rainbow, Rose Gold and also Stainless Steel. Finally, always read the instructions included with this kit for set up and general use. As a result you should enjoy a long, enjoyable time vaping with the Orca Solo AIO Kit. To claim your free gift/s follow these simple instructions. Firstly add an Orca Solo Kit to your basket. Now view your cart contents. You will see at the top a list of e-liquids that you can select to add to your order. This list can be scrolled left and right by pressing the arrow buttons placed on either side. To add a free gift/s to your order, simply choose your product of choice and select the ‘SELECT OPTIONS’ button underneath the product. This will then show the chosen product underneath. Choose the strength you would like from the drop-down menu and click ‘ADD TOBASKET ‘. Repeat the process until the list of products disappear. Now you can proceed to checkout and see your free gift/s in your basket with no additional charges.